2 There are about 4,705,700 Yi people in Yunnan. Chuxiong Yi Autonomous Prefecture and Honghe Hani Autonomous Prefecture are places most compactly inhabited by the Yis in Yunnan. 2.3.8 How Will China and Malaysia Both Benefit from the Belt and Road Initiative? 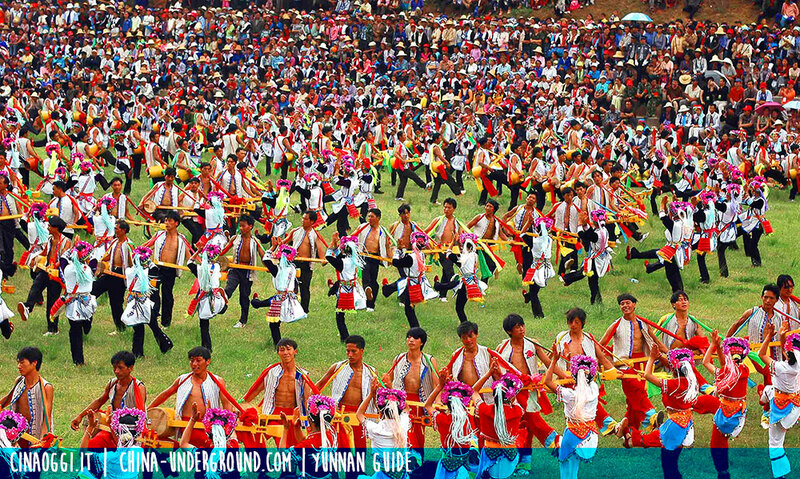 There are about 4,705,700 Yi people in Yunnan. Chuxiong Yi Autonomous Prefecture and Honghe Hani Autonomous Prefecture are places most compactly inhabited by the Yis in Yunnan. 1 There are about 4,705,700 Yi people in Yunnan. Chuxiong Yi Autonomous Prefecture and Honghe Hani Autonomous Prefecture are places most compactly inhabited by the Yis in Yunnan. 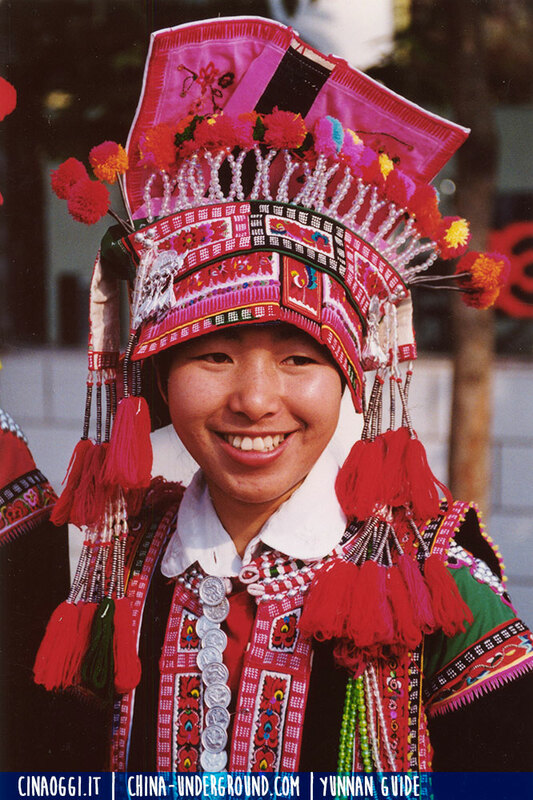 Yi people live primarily in rural areas of Sichuan, Yunnan, Guizhou, and Guangxi, usually in mountainous regions. The Yi ethnic group is the largest among ethnic groups in Yunnan Province, with a population of 4.69 million, totaling about 60% of the entire Yi population in China. It is the most populous ethnic group, making 1/3 of the total ethnic population in Yunnan. Yi people are distributed in most mountainous regions in Yunnan. Their inhabiting area can be summarized as “separated largely but centralized in a small size”. The majority of them live in Chuxiong, Honghe prefectures and Xiaoliangshan region in northwestern Yunnan. The Yi ethnic group has a long history dating back to the 1200 B.C. The Yi ethnic group has over 100 branches. The main Yi subgroups are Nisu, Axi, Lolo, Acheh, and Sani. Sometimes they speak mutually unintelligible languages as they have been grouped into a single ethnicity by the Chinese. In Han language, “Yi” means solemn, ancientness and ample food and clothing. Yi people have their own language and writing system, a branch of the Tibetan-Burma Stock of the Sino-Tibetan Language Family. They believe in primitive religion, which shows the characteristics of animism and ancestor worship. They especially worship fire and regard it as a sacred object. They regard tiger as their totem and believe that after death, kind people will turn into tigers after a baptism of cremation. The fire pit is where the God of Fire lives. Some Yi people believe in Daoism, Buddhism, and Christianity. Yi people worship their ancestor Xinuluo as a local guardian, and they simultaneously worship tiger, spider, and a rooster as their totems. The Yis have their own language and writing system. Situated in the northwest suburb of Chuxiong city. According to the Ten-month Solar Calendar created by the ancestors of the Yi People, one year was divided into ten months into five seasons. There were 36 days in a month, the total was 360 days and the rest 5 or 6 days were defined as an annual festival. Another 5 or 6 days are for annual holidays. In this calendar, the number of months and days is regular and hence easy to remember and the seasons are scientific and accurate. Adopted at least in the Xia Dynasty (2070—1600 B.C. ), this calendar boasts a long history and is the pride of Yi people. Some scholars claimed that it is the ultimate origin of the Chinese civilization. In the outer circle of the ten carved stone moons are 12 Earthly Branch animals. The ancestors of Yi also recorded time by means of the twelve animals, but their system differed from that of Han people in that its first animal was the tiger rather than the mouse. This explains the origin of many place names such as the Horse Street, the Goat Street, the Cattle Street, the Dog Street, and the Chicken Street. In the old days, the names of these animals were employed by local people to record fair dates in these places. Therefore, animal names became names of these places. Yi Opera, created in the 1950s, is popular in Chuxiong.The contents are mostly reorganized on the base of the folk tales of the Yi People, reflecting the modern life, dubbed with the melody of folk music to make it have a heavy civil color and the performing action easy to understand. Chuxiong Prefecture Yi Opera Troupe often often give performances. 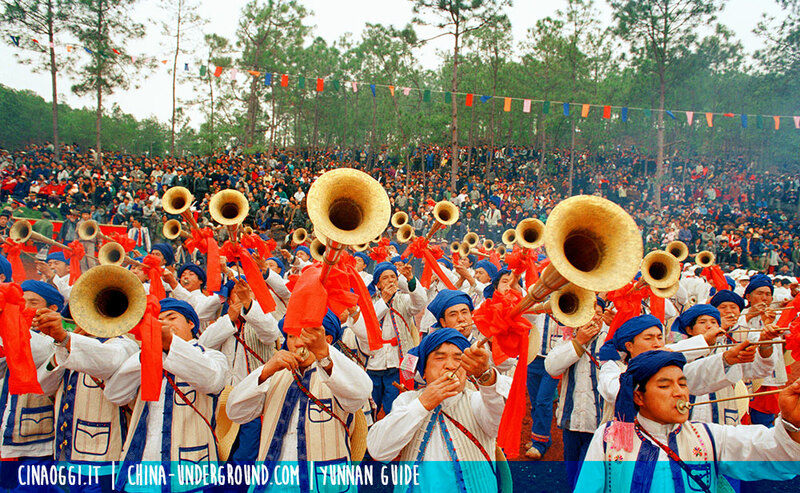 Yi Opera is frequently performed in Tanping Village of Dayao County, the birthplace of Yi Opera. The Solar Lady is a song and dance performance of the Yi People created by Chuxiong Art Theater. It assembles the essence of the costumes, songs, dances, and music of the Yi People in China. There are grand scenes, gorgeous costumes, moving details and beautiful music. It has won many prizes song and dance competitions in China. When you visit Chuxiong, you will have a chance to watch the performance. 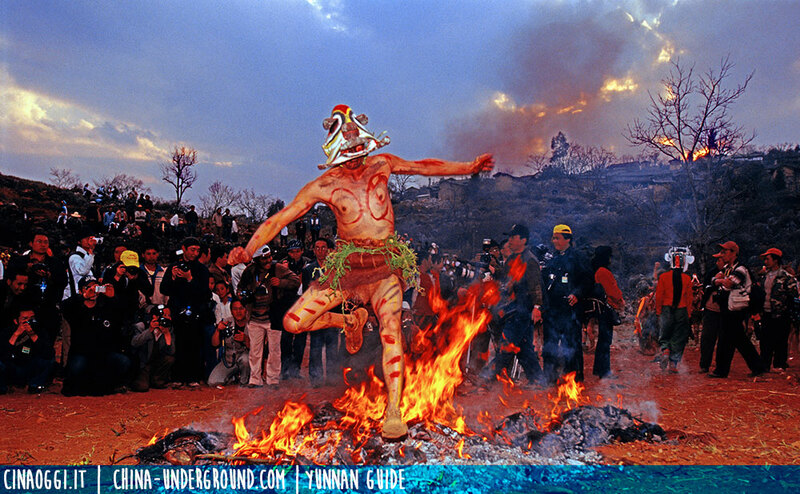 Programs: the Yi people’s singing and dancing activities, playing torches, bullfighting, a fire-sacrifice ceremony, rushing into the fire gate, bonfire evening. It is an important festival of the Yi People in Chuxiong. During the Torch Festival, people sing and dance to celebrate it in the Ten-month Solar Calendar Park, Yi People’s Ancient Town and the main streets in the downtown. The visitors can personally feel the abundant activities and happy atmosphere of the Torch Festival in 3 days. Immortal cave Yi people’s village, at Puzhehei resort Qiubei county, has celebrated “Painter face festival” for 1000 years. Painting face means conquering devil and running ill luck into good, the more face painted, the more auspicious you are. Time and date of the festival will be determined by the number of happy events. 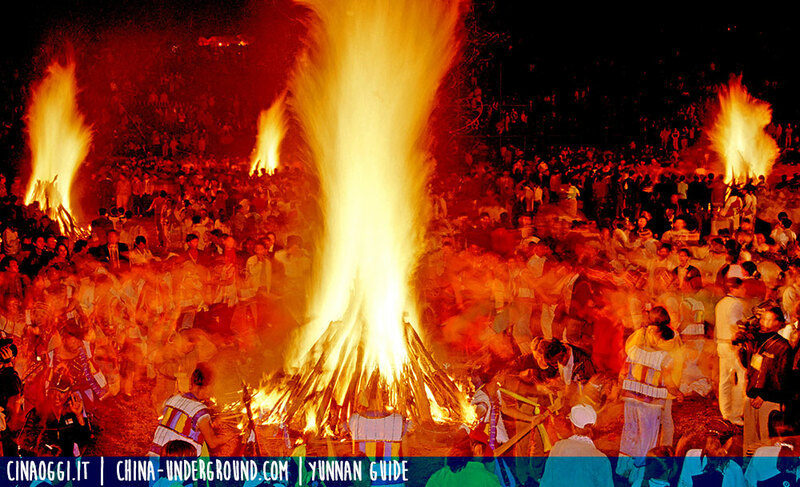 On harvests, weddings or other events, the Yi people in Yunnan usually sing and dance hand in hand in a big ring around a campfire, at least some dozens of people, or hundreds, joining the dance. The singing dancers step leftwise to the accompaniment of lusheng, flute, green leaves, and Yueqin, a moon-shaped lute. In 1986, the U.S. International Folk Art Organization listed the Yi’s Dage Dance as one of the “top 10 favored folk dances of the world”.